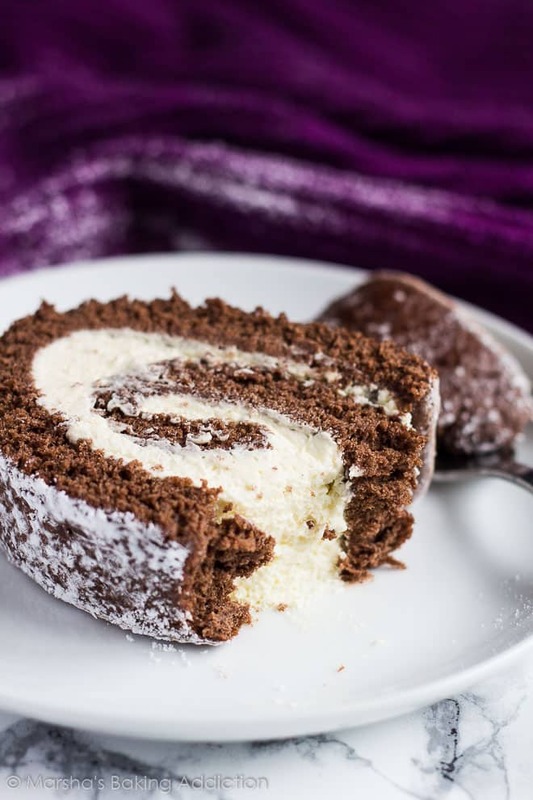 Chocolate Swiss Roll – Deliciously moist and fluffy cake filled with a thick layer of vanilla whipped cream and dusted with icing sugar! One of my favourite things to make are cake rolls. They look so impressive and are perfect for all special occasions and holidays. They can be quite intimidating to make for some, but once you’ve got the perfect cake base recipe, it’s so simple to put together! 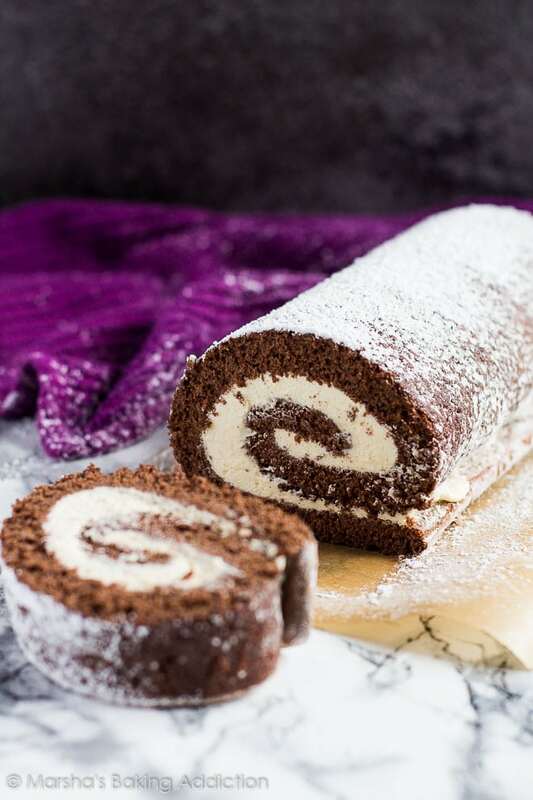 This chocolate swiss roll recipe is so quick and easy to make, you really can’t go wrong. Just make sure to follow my recipe word for word and you’ll have yourself the most perfectly moist, chocolatey, and impressive cake roll on the table. To make this swiss roll, simply beat the egg yolks and sugar until light and thick. Mix in the vanilla, and yogurt. Add the flour, baking powder, cocoa powder, and salt, and mix until combined. In a separate bowl, beat the egg whites until stiff peaks form. Gently fold into the batter. Pour the batter into a greased 10×15-inch cake roll pan lined with parchment paper, and spread out evenly. Bake for 8 – 10 minutes or until a toothpick inserted in the centre comes out clean. Immediately invert the cake onto a tea towel dusted with icing/powdered sugar. Leaving the paper on, roll the cake up with the tea towel, starting at a short end. Allow to cool completely on a wire rack. For the filling, whip the heavy cream until it starts to thicken. Add the icing sugar and vanilla and whip to stiff peaks. Unroll the cake, peel off the paper, and spread the whipped cream evenly over the cake. Re-roll without the tea towel. Cover and refrigerate for at least 1 hour. Dust with icing sugar and serve. the perfect cake to serve at Christmas! How long will this swiss roll last? This cake can be stored, covered tightly, in the fridge for up to 3 days. Can I freeze this cake? 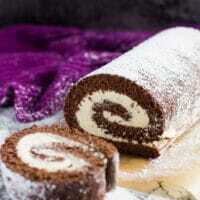 Prepared cake roll, with filling, will freeze well for up to 2 – 3 months. Thaw overnight in the fridge before slicing and serving. This cake is incredibly light, moist and fluffy, it’s the perfect sponge for a cake roll. It rolls up really well and forms no cracks! 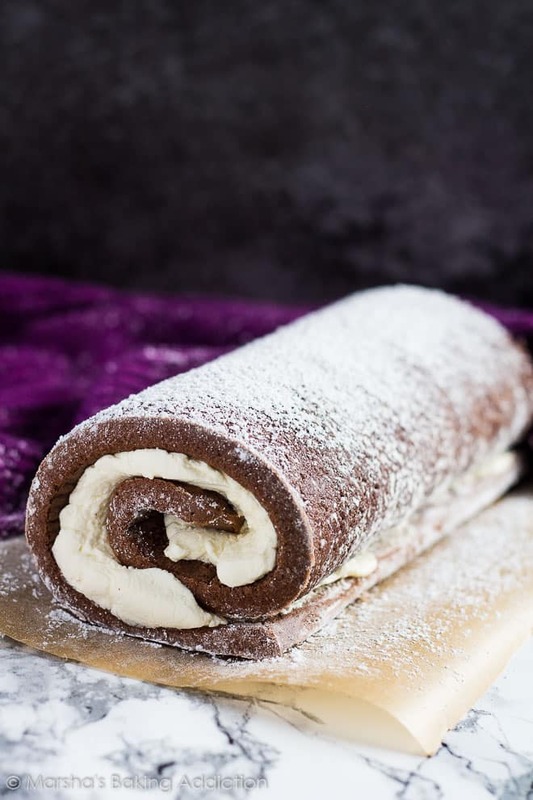 This is my favourite chocolate swiss roll recipe, and it’s so much better than store-bought. The whipped cream filling is just so divine. Infused with vanilla, it’s so creamy and melt-in-your-mouth, I could literally eat it by the spoonful! More cake rolls to try next! Deliciously moist and fluffy cake filled with a thick layer of vanilla whipped cream and dusted with icing sugar! Preheat the oven to 180C/350F/Gas 4. Grease a 10x15-inch cake roll pan, and line the base with parchment paper. Using the handheld or stand mixer, beat the egg yolks and sugar until light and thick. Beat in the vanilla, and yogurt. Add the flour, baking powder, cocoa powder, and salt, and mix until combined. Pour the batter into the prepared pan, and spread out evenly. Tap the pan lightly on the surface a few times to level out the batter. Bake for 8 - 10 minutes or until the cake springs back when lightly touched. Immediately invert the cake onto a tea towel dusted generously with icing/powdered sugar. Leaving the parchment paper on, roll the cake up with the tea towel, starting at a short end. Allow to cool completely on a wire rack. Using a handheld or stand mixer fitted with the whisk attachment, whip the heavy cream until it starts to thicken. Add the icing sugar and vanilla and whip to stiff peaks. Make sure the cake is HOT straight from the oven before rolling. The cooler the cake, the more likely cracks will form whilst rolling. *Make your own cake flour! Measure out 1 cup (125g) of plain/all-purpose flour, remove 2 tablespoons and replace with 2 tablespoons of cornflour/cornstarch. Sift well. Make ahead of time: Prepare the cake as instructed, and refrigerate the rolled up cake (with towel) for up to 1 day before filling and serving. Leftover cake can be stored, covered tightly, in the fridge for up to 3 days. Ohhhh this reminds me of going on vacations or the holiday season! I’ve never attempted to make one myself, perhaps because I am a bit scared… But I think putting a nice end result like that on the table will make it all worthwhile! Oh my gawd, my husband LOOOOOVE chocolate swiss rolls, Marsha! He is going to die over this! Love that you filled this with a THICK layer of vanilla whipped cream! Totally worth every single calorie! Cheers! My favorite cake of all. That looks amazingly scrumptious, Marsha!! The photos are super tempting. This recipe really tugs on my heart strings… well, and my hunger pangs! Swiss cake rolls take me back to my childhood, and I love every bit of it! Can’t wait to try this! I’ve always had a hankering to try making a Swiss Cake Roll around Thanksgiving or Christmas, but I’ve never quite gotten up the nerve. I’m always afraid of it cracking. But yours looks so beautiful. I might have to give it a shot! Takes me back to childhood and eating Little Debbie’s Swiss rolls! 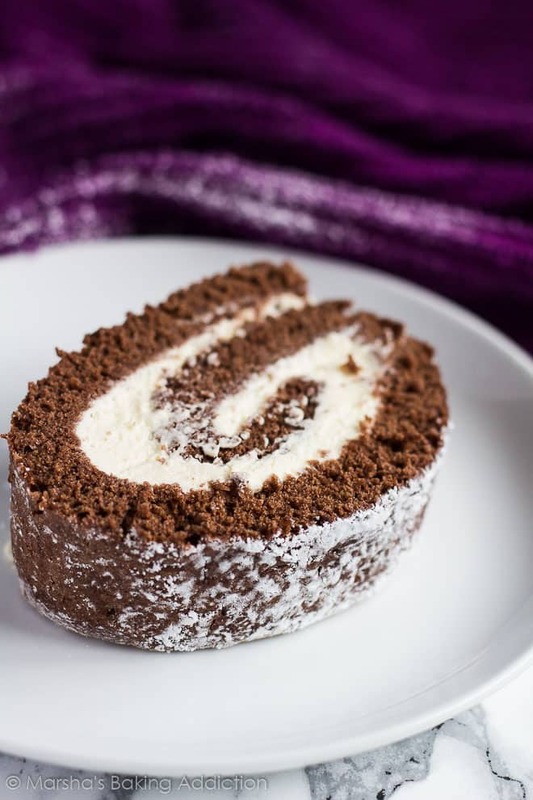 I’ve never made a cake roll – I’m so afraid it will break on me! It will be worth the risk though if I’m able to pull off one as gorgeous as this one! Whenever you make a roll like this it is gorgeous! I am a major chocoholic so this one is totally up my alley! Hi this greek yogurt is essential for this? If so can we substitute with anything ? Hello, can I use buttermilk? This looks so good, I can’t wait to make it. Can I use dutch processed cocoa instead of natural cocoa? Mine came out super flat… What did I do wrong? ?also the first mix with the flour, sugar etc came out pretty thick.. It loosened up with the egg whites but still. I can’t really say without being there to see what happened. The cake should have been quite thick with using 4 eggs, and whipping the whites to firm peaks. All I can say is make sure to whip the egg whites to firm peaks, and no liquid remains. Hi, just for my info would like to know what does yoghurt add to this recipe? Is it for lighter substitute for butter ? Just made this recipe and it turned out perfectly. I was a little hesitant to attempt a roll cake but it looks great. No cracking and very easy to roll. I did add a bit of gelatin to stabilize the whipped cream. I’m so glad it turned out for you! I hope you enjoy 🙂 Great tip on the whipped cream! Your instruction was wrong and ruined a batch… You really need to state that sugar needs to be divided and added to egg white as well. I just got egg white foam according to this recipe. Already had added all the sugar to the yolks. So this recipe might be alright but due the wrong instruction I’m not so glad to come across this recipe. The instructions are correct. You beat the egg yolks with all of the sugar, and whip the egg whites by themselves to firm peaks. This looks delicious. Do you freeze the roll with the filling? I just made this and my roll cracked! Do you know why? Oh no! This cake never cracks on me, so it’s hard to say what went wrong without being there. Be sure the tea towel you use to roll the cake up in is generously coated in icing/powdered sugar, and invert the cake onto it while it is still VERY hot (as soon as it comes out of the oven). This makes the cake easier to handle, and roll up. Hi Sumayya! A few possibilities can make a swiss roll rubbery and dense. 1.) Overmixing can create gluten which can cause this. Try not to overmix when folding everything together. 2.) Make sure not to overbake, this can cause the sponge to be tough. I would also use an oven thermometer to make sure your oven is the correct temperature. This was my first cake roll and It cracked. Wish I could figure out why but will definitely try again. Does it have to be low fat yogurt? It was cooled. 99% and I wonder if I should of thrown it in the fridge for a bit. It still held together with the filling so although not gorgeous it will taste great for home! Hi Alison! I’d say the #1 tip for no cracks is to immediately invert your cake onto a tea towel and roll up (as instructed) whilst it’s still hot from the oven. The cooler the cake, the more likely cracks will form when trying to roll. Also, try not to over-bake. This can also lead to cracks when being rolled. You want to pull your cake out of the oven as soon as the cake springs back when you gently press it. Can you please tell me if you roll the tea towel up with the cake or just use it to assist rolling?